TD Friday – Offerings 3! August 28th is approaching … meaning Offerings 3 is right around the corner. That’s right, round 3 is here! The past two nights of Offerings have been such a blessing, how could we not take another opportunity to give heartfelt praise to our Creator, who has given us our unique abilities, talents, and skills? During our summer series, “Potent Once More”, Arthur reminded us of the importance of our “being” and how it comes before everything we do. Spend some quiet time before the Lord and prayerfully ask Him how He can be honored that night in light of the new beings He has made us to be … in Christ! “TD Open House” This Friday! 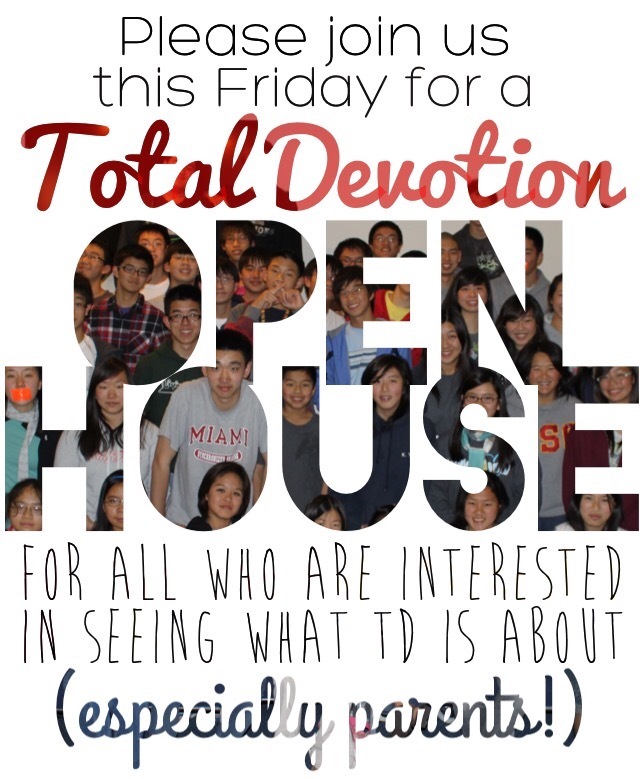 Q: What is the “Total Devotion Open House”? A: It is a chance for everyone interested in TD to get to know the vision of TD, the people of TD, and the God of TD. Q: Can my siblings come? We need each of you TD’ers to invite your parents!!! If you have any questions, let your small group leaders know. See you on Friday! But, we need you to come … frumpy. Yep, frumpy. Please come in ugly, frumpy clothes. Don’t do your hair, don’t gel it, no hairspray, don’t blow dry it, don’t shave, don’t put makeup, no bows, no hair clips, no jewelry. Wear your glasses, not your contacts. Wear flip flops or old shoes you’d normally only wear around the house when nobody’s around. We’ll explain at TD!